Nylon soft choke. An alternative to the traditional chain choke. 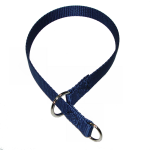 Available in 3/8, 5/8, 3/4 and 1 inch widths in an assortment of colors. Pawmark Quick Snap Collar looks great and is built to last. Features a quick snap buckle for ease of use and safety. 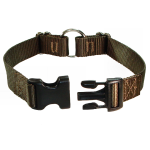 Known for it's rugged durability, this quick snap collar also offers a very comfortable fit. Available in 3 sizes and 13 colors! Handcrafted by Pawmark. Made in the USA!